Depending on what you read you’re told that this generation has it better or worse than the previous one and there’s usually a lot of doomsayers ready to point out why the next generation is screwed. But then I bet all of that is true of every generation. All the time I read about people my age who can’t leave home because it’s impossible to move out on their minuscule wages and all the rest of it, how they have a worse standard of living than their parents. But none of that is really relevant to me. Simply because most of the things people my age are doing I’m not, at least not yet anyway. A lot of those things I can’t yet do and some of them may never happen for me. So I don’t have to worry about the cost of moving out, or the expense of a car or the difficulties of finding work. Though I wouldn’t mind having that last one to worry about. Wherever I end up living and with who I would really like to have something to do with my time. Even just a part-time job would be great. It sounds like fun being able to do whatever you want and having all your time to yourself but it has it’s downsides. Problem is the kind of things I can do don’t seem to be there anymore. The sort of jobs I would have been not only able to do but actually happy doing just don’t exist anymore. Everything these days seems to rely on social skills in some way. And even if it’s not a job in which social skills feature heavily you still have to convince them to hire you. I’d love to know the answer to that question, to how I can stop making other people feel uncomfortable. I be myself and it’s wrong, I pretend to be normal as best I can and it’s still wrong. Hiding away seems the best option sometimes. All of this is all so depressing, it wasn’t my intention to write about such things today. Then I made the mistake of reading the news, just one article but it’s one I really shouldn’t have read. Another proposal from the government as to how screw disabled people over, because they just didn’t take enough. They want to make life even harder. At the same time they preach about everyone needing to work they take away support which enables disabled people to do that. They make it harder to get to work and to live at all really. It seems they don’t want you to work, to get an education or to live any kind of life which is worth living. Like I said, it’s depressing. In theory this generation of disabled people should have it better and somewhat easier than previous ones. After all there’s disability specific legislation which is meant to protect against discrimination, more awareness and knowledge, better access to education and to other opportunities. Yet in a lot of ways it seems to all be going backwards. If I write anymore on the matter it’s going to ruin what’s left of may day so I’m going to stop there. No wonder I’d rather lose myself in stories, stickers and football when real life is so depressing. And to think earlier I was giving thought to whether I should stop hiding away and start getting back to reality a little more. I don’t think so, I think I’ll stay right where I am for the moment. Before reading that article today was a good day, not in terms of sleep or of getting anything done. But it’s had it’s good points, like getting two old Dortmund games for my collection and my YouTube channel getting one million views. Or to be precise 1,007,040. That’s where it’s at right now, I like the fact there’s both a four and a seven in there. As for the best thing of all today and the real reason I won’t let anything ruin the day, my latest crazy addition to my collection. 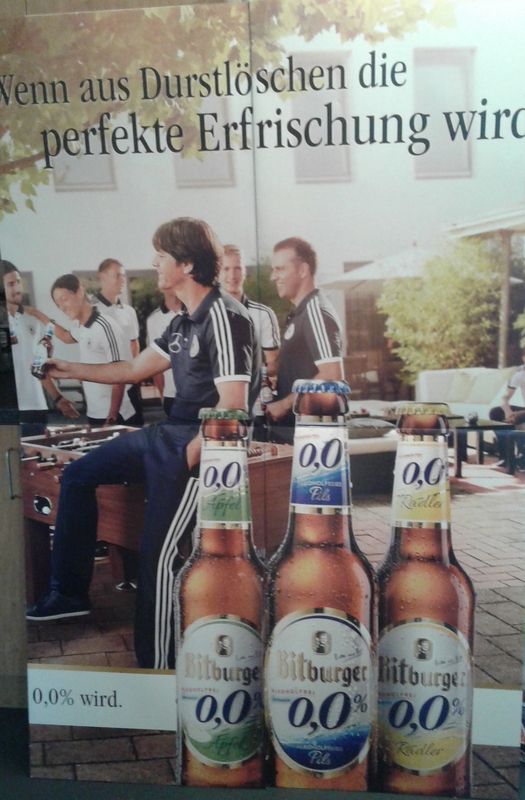 The Jogi advertising board finally came. The picture doesn’t show all of it, it’s actually composed of three panels not two. But I had to fold out Mats Hummels. It’s not because I’m mad at him for leaving Dortmund for Bayern, I couldn’t care less about that. I never liked him that much to begin with so I’m happy I can fold him out, I would hate to wake up everyday and see him there. It’s crazy I know but I’m happy, so who cares. This entry was posted in Autism, The Daily Prompt and tagged Autism/Asperger's Syndrome. Bookmark the permalink.